The islands of Venice, Italy, are a delighful discovery, a pleasant trip to some off the beaten path areas in the Veneto’s lagoon. Don’t get me wrong: even in Venice itself you can easily find out a lot of back streets and small squares away from the crowd, where the only noises you can hear are your own steps. However, the dozens of islands surrounding Venice are often worlds apart: some of them are wild and uninhabited, others host a few hundreds or thousands people, but many of them, even the most visited by tourists, still feature the secludedness and charm typical of islands. Anyway, just taking a boat and admiring the Veneto’s lagoon from the sea on your way to ones of the islands of Venice is a great experience in itself. Have a look here below at Venice, which is in turn made up of 118 flat islands, and at some of the Venetian islands I'am going to talk about. 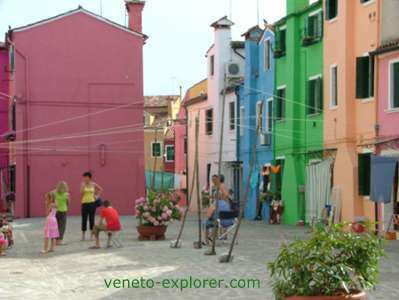 One of the most characteristic islands of Venice is without doubt Burano, worlds apart in the wide Venetian lagoon. Even though today lace-making and fishing, for centuries the economic hub of the island of Burano, are in decline, still Burano keeps its suggesting and timeless atmosphere alive. All you have to do is enjoy strolling around its pictoresque calli lined with colorful houses mirroring in the water, and get to the main Piazza Galuppi, the most lively square of Burano. There, in a Venetian gothic palace lie the Lacemaking School (still working) and Museum. Beside there is the gothic Palazzo del Podestà, and the 1500s Church of San Martino, hosting in its interior a painting of Giambattista Tiepolo. Close to the church stands a leaning bell tower. A series of lace stores line the Galuppi square, some of them selling antique laces too. Along the fondamenta (Venetian name for the pedestrian ways along the canals) away from the main square, use to dock the boats selling fruit and vegetables. Take a walk along the typical fondamenta Cao, Cavanelle and Della Pescheria and down their back streets with their characteric quarter. 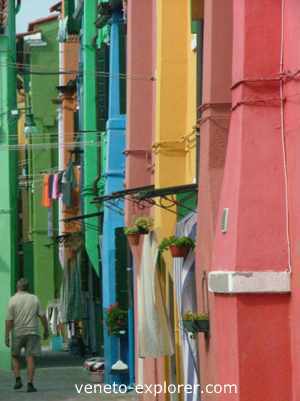 There isn’t much more to see in Burano: the real attractions is the island in itself, its evocative atmosphere, its bright colorful houses, its old ladies sitting together just before their house doors, chatting and making laces, the yelling of local children playing outdoor.. Finally, you'll have the chance to spend a pleasant evening having a dinner based on Venetian food in one of the few restaurants of the island. Take the vaporetto (water bus)nr 2 at the Fondamenta Nuove in Venice. 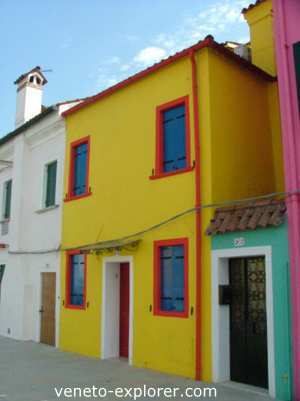 The journey to Burano lasts about 45 minutes. Shortly before reaching Burano the vaporetto will make a stop in the island of Mazzorbo, embellished with plenty of gardens and orchards. 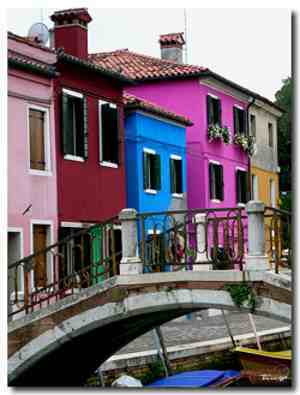 The island, connected with Burano by a bridge, enjoyed its days of glory back in the 14th-15th centuries. Remnants of its bright past are the bell tower of the (demolished) Chiesa di Santa Maria in Valverde and the Church of Santa Caterina. Another of the minor islands of Venice nearby Burano is the lush San Francesco del Deserto: you can get there from Burano by hopping into a private boat. The small island hosts a 1200s Franciscan monastery, made up of two cloisters and a little church. The monastery is open to visitors (9am-1am and 3am-5am).